Site Reliability Engineering (SRE) models focus on maintaining the dependability of infrastructure, and DevOps focuses on moving developers and ops closer to each other. The result is engineers who are on call, which sounds fantastic, and it would be if every engineer knew everything. Getting your rotations right for on-call engineers can be more art than science. You have to accommodate fairness, personal schedules, and interpersonal relationships. There’s a more scientific side as well, of course, which includes aptitudes and areas of expertise, escalation plans, and work schedules. Complicated scheduling and escalation plans are poor candidates for spreadsheets and whiteboards. Read the new xMatters guide, Who’s on Call? 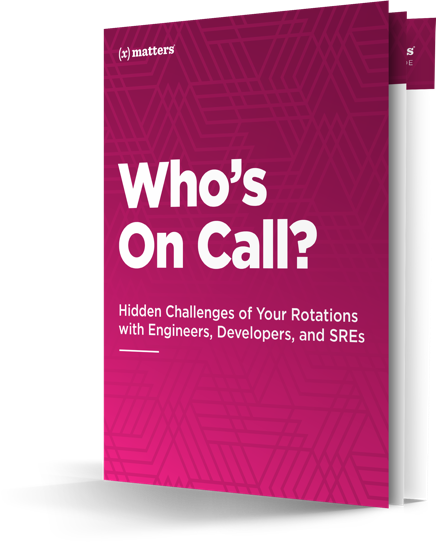 Hidden Challenges of Your Rotations with Engineers, Developers, and SREs, to learn how you can overcome the challenges that stand in the way of effective on-call rotations. Fill out the form to get the guide.